by Alexandre Dumas (1802-1870). Translated by W. Robson (1785-1863). The Three Musketeers (Les Trois Mousquetaires) is a novel by Alexandre Dumas, p?re. It recounts the adventures of a young man named d’Artagnan after he leaves home to become a musketeer. D’Artagnan is not one of the musketeers of the title; those are his friends Athos, Porthos, and Aramis — inseparable friends who live by the motto, “One for all, and all for one”. 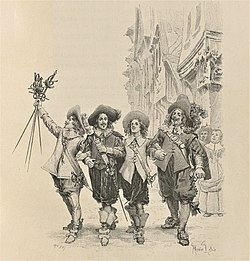 The Three Musketeers was first published in serial form in the magazine Le Si?cle between March and July 1844. Dumas claimed it was based on manuscripts he had discovered in the Biblioth?que Nationale. It was later proven that Dumas had based his work on the book M?moires de Monsieur D’Artagnan, capitaine lieutenant de la premi?re compagnie des Mousquetaires du Roi (Memoirs of Mister D’Artagnan, Lieutenant Captain of the first company of the King’s Musketeers) by Gatien de Courtilz de Sandras (Cologne, 1700).